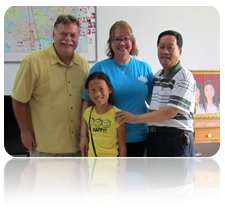 Lotus Newsletter Editor interviewed Jenny, Steve and daughter; Hope from Michigan, one of our tour families, about their experience volunteering at the Luoning orphanage in Henan Province during June 2013. Below is a summary of highlights from that interview. Editor: Can you tell me about the overall trip experience and your thoughts on it, now that you have been home for several weeks and settled back in? Jenny: It was about the most ideal experience a family could have, I think. We joined a group tour for the beginning portion to visit the bigger cities, like Beijing, Xian and Chengdu. That time of our daughter being with kids her own age and with similar history was invaluable – I think that “being part of a group” thing was very important for her. I heard one of the kids talking and asking about another’s “finding spot”. It was so powerful -- there wasn’t any need to explain what that meant and have quizzical looks. It was this shared bond of NOT needing to explain anything that made the group thing so powerful. It also helped set up things for later when we had a more emotional part of the trip. Steve: I agree -- the group tour part was very important. It all fit so well. That group time was vital to engage and get immersed into what China is. Our daughter, Hope, just enjoyed her time hanging out with other kids like her, at the back of the bus. This group time just kind of helped warm the kids up to being in China. The parents were towards the front of the coach and the kids gravitated to each other. The way to think about this is that part of our story is shared and has a common narrative, but then, like every family it diverges. Our story, like every other adoption, is unique and special. We loved our time traveling with the entire group, but then it was time to find our own way to begin understanding Hope’s roots. That’s when we broke away to travel to Luoyang, Hope’s hometown and the smaller city of Luoning. The opportunity our family had to visit our daughter’s SWI in Luoyang and volunteer at another similar facility was just amazing. Jenny: Several things just fit together for us to go in the summer of 2013. 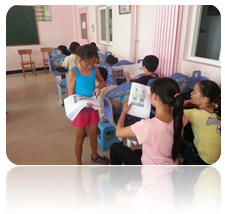 Hope’s orphanage director had formerly been at Luoyang, but we heard that he had moved to Luoning. Then we saw that Lotus was offering a volunteer opportunity at the Luoning SWI, where Hope’s director moved – well it just seemed like it was the right time for us to visit. We’re so glad we did – it was an incredible experience. It’s hard to say how the experience could have been improved – but there is one thing. If there had been other families with kids along to volunteer with us—that actually would have been even better! Steve: One aspect that made our trip so great was going to a rural location. Things really change when you go to a small town in China -- it immediately takes you out of the role of an observer and puts you in the role of participating. It totally changes the perspective and the experience. You cannot get that as part of a larger group in a big city like Beijing. It was great that we had the chance to do both in the same trip. I agree with Jenny – it was really ideal to be able to do the group thing and then have this volunteer experience in the small town. Editor: How did you spend your time as a volunteer? Jenny: We weren’t sure what to expect. Will we help paint, work in the kitchen or just spend time with the kids? As it turned out, our job was to just connect and give these kids help throughout their day. Steve: No sooner than we entered the Luoning SWI, we were swept into the day-to-day activities of the children. 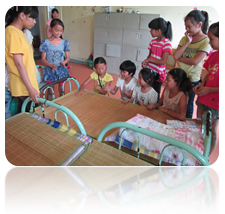 Within the hour, Hope was playing with the girls in their dormitory. The kids have been learning English and the girls spent their time finding ways to play, that frankly we never could have anticipated. Some of the kids were getting ready for a sponsored trip to live with American families, so we helped in several English classes, giving them an idea of what to expect on the long flight to the U.S.A. It was fun and deeply satisfying to help just a little. Editor: It sounds like the trip had a great flow to it for your family. Jenny: Yes, going to Luoning, gave us a sense of the people – which was incredibly valuable. It is a profound thing to connect with the SWI and volunteer – there are still a lot of kids in that facility – mostly special needs. We don’t know all their stories, but we do know it means their parents couldn’t care for them. And it was rewarding for us to help out—even in small ways. It just felt good to be able to give back just a little--to be able to reconnect and give back -- and see the adults who work at the SWI’s and how they help kids like our own child who wasn’t adopted until she was two years old. I think it gave Hope a better idea of what those adults were like and how they helped her in her younger years. We were exceptionally grateful to have had this opportunity to give back. It reminded us of how lucky we are to be a family. Being able to reconnect with the people at Luoning helped us to connect to this part of our family story. Steve: A lot of thanks also goes to our guide, Li, who had a strong relationship with Director Pei of the SWI in Luoning. 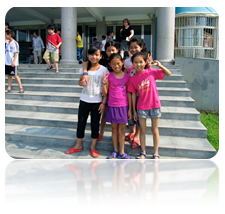 Director Pei has a confident approach to reaching out to gain assistance from Westerners for the benefit of the children. So, because of who he is, and the strong relationship with our guide, it worked out for us to literally stay at the orphanage building, which gave us a greater sense of being part of the community. That may not work for other families in the future, but families can stay in the larger city of Luoyang, and just drive to the SWI –it’s only about a one-hour drive, which is pretty doable. Jenny:It would be great if other families could help out there too. I think Director Pei has come out of retirement once, and there is a younger man in his early 40’s who appears to be the person who will take on the role of orphanage director once Director Pei leaves. I think whatever Lotus Travel can do to assist other families to go there – it will be good. Spending time there gave us some wonderful times and unique insight.